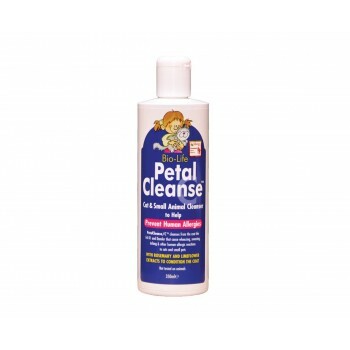 Petal Cleanse is a liquid that is applied to the hair/fur of your cat or small pet to reduce the allergens that escape into the air and can make human life a misery. Allergic reactions to small animals often take the form of breathing difficulties, wheezing and coughing, along with sore inflamed eyes that run and stream. Humans can also suffer with skin problems such as hives, skin rashes and skin 'itchiness'. Both eczema and asthma can also be triggered by exposure to small animals. Help is at hand though, with Petal Cleanse. The solution should be applied to the animal's coat or fur using a sponge or cloth, having already given it a good brushing to remove any loose or dead hair. Wipe your pet all over with the moist sponge or damp cloth, and then towel dry it. The solution can also be used on birds and their feathers - though don't attempt to towel dry them afterwards, let them air dry, ensuring that they are kept out of draughts. Wash your hands afterwards. The solution should be used ONCE A WEEK, EVERY WEEK to keep the level of allergens in your house down to an acceptable level. 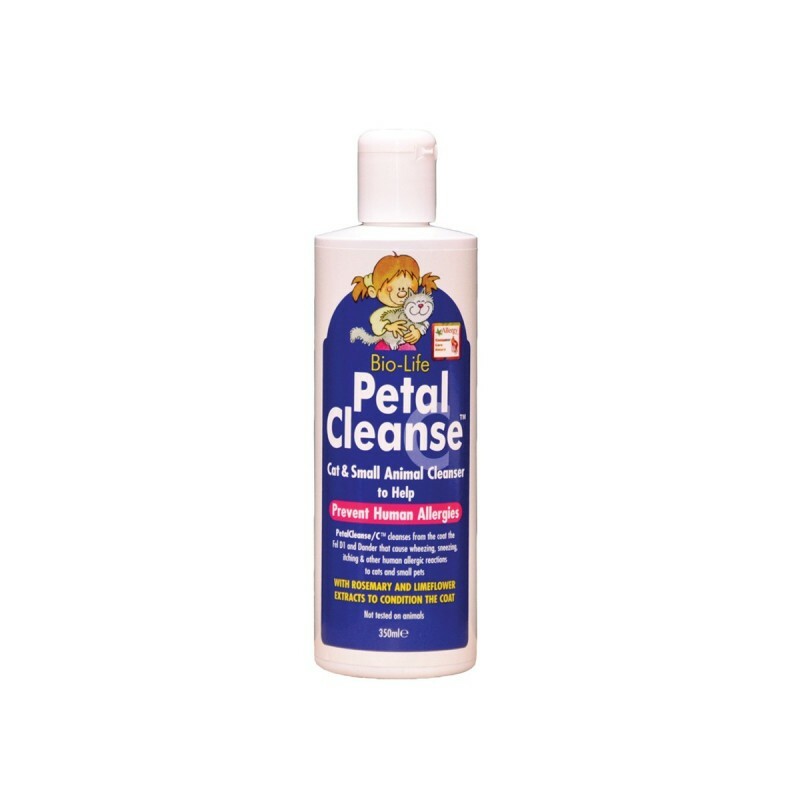 Petal Cleanse can takeup to 3 weeks to relieve the symptoms in the sufferer because it takes a while to cut down the levels of airborne allergens in the domestic environment. If you are treating the pet for the benefit of a friend or relative who will be visiting, it is advisable to start the treatment at least 2 weeks before they arrive. 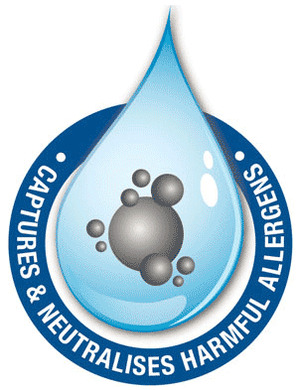 Response times can be dramatically improved by using AirCleanse, which, when sprayed into the room, will help cleanse the air of suspended irritants and airborne particles of pet dander and other allergens. Trials within the UK have shown that over 97% of those who exhibit allergic responses to their pets benefited from the use of Petal Cleanse. 350ml bottle will last about 12 weeks for an average pet.